In another field of cloud, Oracle has done something big this time, as it reinvent its core product, the database. Its my personal belief, if any organization stick to its core product (along with the new area of developments/products), its not easy for competitors to cross that organization all along. “Stick to the basics” is the key. I was going through the new offering from Oracle and collected some good facts, which I am sharing here. As far as any product company understands the need of the time (and IBM is doing a great work in this area), they keep enhancing their core products which add the business value to the customers. Need of the time is, solving, managing and handling big data, making solutions which are not complex to the customers, availability, scalability and under budget. As organizations evolve their products, business models, and processes to keep pace with today’s dynamic global marketplace, a powerful new database offering DBaaS, that’s optimized for cloud computing and Big Data, helping organizations to cut costs through consolidation and simplified management. Oracle Database 12c features (backtracked to 11.2.0.4 too) a new architecture that allows customers to consolidate many databases into a single multitenant container database in the cloud that’s more scalable than traditional databases. And datacentre? No, this will soon be a past word, the way things are going. That is why, its named as database as a service. In layman terms, the database storage and memory is not any more located “on premises”. The Oracle Database Cloud Service – Virtual Image level includes Oracle Database and supporting software. You have to install this software yourself, and you are responsible for all maintenance operations for this software. You have root privilege, so you can load and run software in the compute environment. You have full administrative privileges for the Oracle database. The Oracle Database Cloud Service level also includes Oracle Database and supporting software. However, the software is installed for you, an Oracle database is created using values you provide when creating the database deployment, and the database is started. Additionally, you can direct Database as a Service to set up automatic backups. Finally, the deployment includes cloud tooling that simplifies backup, recovery, patching and upgrade operations. You have root privilege, so you can load and run software in the compute environment. You have full administrative privileges for the Oracle database. You are responsible for making any changes to the automated maintenance setup, and you are responsible for recovery operations in the event of a failure. As per Oracle, there will be no more Release Value Proposition (RVP) documents, going forward (starting from PeopleTools 8.55), there is “Planned Features and Enhancements” document which replaced RVP. From that document, I have tried to understand and gather as much as information I can and putting it below. I have not downloaded and installed this release, however based on PT 8.54 experience, I can connect with the new features delivered with PT 8.55. I have been through with PT 8.55 “Planned Features and Enhancements” document thoroughly and I have taken abstracts from there to complete this post. Oracle is offering a new feature “PeopleSoft Deployment Packages (DPKs)” to install and configure your PeopleSoft environment. This is an enhanced utility by which we can do the installation and configuration of PeopleSoft environment, rather than using standard VCD installation. DPKs allow fast deployment of a PeopleSoft environment on any hardware platform—physical/virtual. In PeopleTools 8.54, Oracle introduced “Push Notification” feature, where they gave ability to the end user to subscribe for real time notification for the server events, for which user subscribed. In PT 8.55, they extented this ability for iOS and Android devices, where end users may subscribe to events and have notifications directed to their Android or iOS mobile devices. Prior to PeopleTools 8.55, for debugging issues that span both the application and web servers, log files were correlated based on the common field – timestamp. Additionally, the timestamp could vary between servers if the time is not synchronized, which made the debugging activity difficult and error prone. In PeopleTools 8.55, new fields are added to the application and web server domain logs that help easily correlate log entries on the middle tiers. Correlation data is logged when available, otherwise placeholders (hyphen) are used in place of correlation fields to maintain uniformity of format in the log files. **Integration Broker, trace, and third-party log files do not include correlation information. However, all log files include placeholders (hyphen) for the correlation fields to maintain uniformity of format in the log files. Improvements have been done for replicate/import web domain directly from the command line, refresh PS_CFG_HOME etc. Enable business analysts to author rules in Oracle Policy Modeling (OPM) using natural language sentences written either in MS Word or MS Excel. Enable business analysts to build and process complex rules on Oracle Determinations Server outside of PeopleSoft components. SQL Access Manager (SAM) has been enhanced to support WITH and MERGE statements, the SQL constructs that allow combining multiple DML queries into a single query to boost the performance. This functionality can be used with SELECT and INSERT statements, not with UPDATE and DELETE statements. Also, SAM does not modify/verify the syntax of the WITH and MERGE queries, it just passes the queries as is to the database for execution, hence its the developers responsibility to pass the right code. PT 8.55 provides the ability to setup and utilize the in-memory functionality for PeopleSoft, which is delivered in database Oracle 12c. This is again a performance booster, as per notes. Oracle included the support for Materialized Views for SQL Server and DB2 z/OS, which was there only for Oracle database till PT 8.54. In PT 8.55, the system will not provide the feedback if a correct user ID is entered or if the correct response is entered to the password question, to reset the password by using “Forgot Password Utility”. This is another security step taken as a part of “Secure Configuration Initiative”. In PT 8.55, the maximum length for the database access ID password and for the connect ID password has been extended to 32 characters. Also, PSACCESSPRFL table has been replaced by the PSACCESSPROFILE table to accommodate the longer passwords. When generating private keys for application server-based digital certificates, by default PT 8.55 uses the SHA-256 with RSA encryption algorithm and the 4096 key size. When using PSKeyManager to generate private keys for web server-based digital certificates, the default signing algorithm is SHA-256 with RSA encryption. In addition, the PSOPRDEFN table features a new column for SHA-2 hashed passwords. In this release the My Preferences framework has replaced the My Personalization framework. The My Preferences framework provides a WorkCenter-like interface for end-users to view and configure system-level preference items, such as time format, date format, default dictionary language, and so on. This feature enhanced for PeopleTools Performance Monitor (PPM). Now PPM will have dashboards for monitoring health, load, and performance in real time, alerts for potential availability or performance problems, integrated logs (in-browser viewing of all log files). The automated configuration management framework allows to automate product configurations using your browser (PIA) or from the command line. This framework enables to store the environment configuration settings in a template stored in the database or an external template file. Because these settings are set once, and then saved, one can leverage the stored settings and reapply them easily when needed. PeopleTools provides two methods of running the automated configuration process — using the Automated Configuration Manager browser interface in PIA or using the command line. (See Appendix section below to know more about ACM). These plugins are available for IB, Push notification, error handling, validations etc. Enterprise Manager 13.1 release including new responsive UI to adapt automatically to different form-factors such as mobile/tablet clients. The administrator can schedule automatic discovery to happen from the Enterprise Manager console at periodic intervals such as once a day. PeopleSoft Plug-in will sweep thru all the hosts and discover PeopleSoft Targets automatically. This feature intends to make the PeopleSoft Plug-in smarter by automatically detecting the required environment variables needed for running PeopleSoft utilities such as psadmin and psae to monitor the PeopleSoft domains. This will reduce the need do complex configuration steps like setting right “.profile” script or psemenv.sh script (as psoft user) with environment variables needed for running the PeopleSoft Plug-in. As soon as the PeopleSoft Plug-in is deployed on the Enterprise Manager Agent, it is ready to administer and monitor the PeopleSoft Domains without any pre-requisite setups needed to make the plug-in to work as a “psoft” user. The DPKs include a bootstrap script that deploys a default instance of each of the PeopleSoft mid-tier domains—PeopleSoft Pure Internet Architecture (PIA), Application Server, and Process Scheduler domains. These domains are fully functional out-of-the-box. However, it is assumed that you will need to make changes to these deployments. These changes will be required to reflect your organizational standards, preferences, and customizations. DPKs set up your infrastructure for you—“infrastructure as a code,” which allows you to customize the environments to produce various topologies to serve different functionality, such as test environments, environments for performance testing or development environments, and so on. Notably, these customizations can be retained across maintenance application (upgrades, patches, and updates). Using DPKs to create a PeopleTools middle-tier (Application Server, Process Scheduler, and PIA) typically takes less than 15 minutes. This allows for dynamic scaling and quick patching. With such fast creation of the middle-tier components, you can optimize hardware resources by creating middle-tier virtual machines (VMs) on demand. These VMs can be removed to release the resources when not in use, yet be quickly recreated as needed. DPKs are integrated with PeopleSoft Automated Configuration Management (ACM) to provide PeopleSoft application configuration using plug-ins delivered by the PeopleSoft Application. For example, for all deployed environments, the Integration Broker and Gateway are set with ACM plug-ins, as is Oracle SES for demo environments. DPKs allow for fast environment cloning. After creating an environment clone, you can use PeopleSoft ACM plug-ins to modify the configuration settings, such as those for Integration Broker, from those used in the original environment, to those required for the cloned environment, during the deployment of the middle-tier using PeopleTools DPK. DPKs can be used, to easily and effectively, create a fresh clone from your existing environments. Using database snap cloning, an environment clone can be achieved in less than 30 minutes. Oracle Policy Automation (OPA) is a suite of software products for modeling and deploying business rules within enterprise applications. It is a specialist application that is focused on modeling, automating, and optimizing the implementation of policy, legislation, and complex business rules. Oracle Web Determinations – The Web Determinations is a web application that allows rapid deployment of interactive applications based on rules. Oracle Determinations Server – The Determinations Server is a web service interface that allows remote client applications to send assessment data, perform inference based on chosen rule-base and returns the determination of the inference to the requesting client. It is built on top of the Determinations Engine. Oracle Determinations Engine – The Determinations Engine is the core component of the OPA, which provides basic services for executing rules based applications like inference mechanisms, metadata to build rules and natural language support. Oracle Policy Modelling (OPM) – OPM is an integrated development environment that supports all aspects of the OPA lifecycle like natural language based rule authoring with MS Word or MS Excel, debugging of rules, comprehensive rule testing facilities and has integrated source control to store multiple versions of the rules. Oracle Policy Automation Hub (OPA Hub) – OPA Hub is a central administration console with a repository database for storing Rules Projects and provides connections to third party applications, for example PeopleSoft, to fetch data models. It is a Web application deployed on WebLogic domain. With each new release, Oracle PeopleTools provides new technology to our infrastructure, which adds rich, new features to support the functional requirements of our applications. While the new technology enhances the user experience and capabilities of our applications, the new technology often brings additional steps to the environment configuration and implementation process. This can create challenges for system administrators, development teams, and testing teams who routinely set up numerous environments that need to be refreshed on a regular basis. For example, with each implementation, system administrators routinely deal with multiple copies of various types of environments, such as production environments, testing environments, demonstration environments, , development environments, and so on. Oracle PeopleTools and PeopleSoft application teams share this same challenge. or an external template file. Because these settings are set once, and then saved, you can leverage the stored settings and reapply them easily when needed. PeopleTools provides two methods of running the automated configuration process — using the Automated Configuration Manager browser interface in PIA or using the command line. When running the process from the command line, you can use a batch file or shell script or the Application Engine command line options. After setting up the basic infrastructure of a PeopleSoft environment, including database, application server, Process Scheduler server, and PIA domain, you run the configuration program (either using PIA or command line). This configuration program reads your configuration settings (referred to as environment properties) that you have stored in the template or template file, and inserts the stored values into the database, saving you from updating the settings manually each and every time you create or refresh an environment. The settings stored in the template or template file are those that you typically enter on a configuration page in PeopleTools and save to the database. For example, the value for your Integration Gateway URL, which you would normally add manually on the Gateways page, can be entered in your template or template file once, and then retrieved by the automated configuration management framework and inserted into the database each time you refresh that environment. A template is a composite of configuration plug-ins in which the properties and its values are defined. The configuration program fires configuration plug-ins that take the properties specified in the plug-in and configures the feature associated with that plug-in. Each plug-in provided is focused on a particular setting or functional area of your configuration. You enable configuration plug-ins by referencing them in your template or template file and specifying the settings for that configuration plug-in to insert into the appropriate fields in the configuration interface. Automated Configuration Manager uses a template to store settings and run a configuration program. In a template, you can include all the product configurations called plug-ins that you require for an environment, and you can group the plug-ins based on the product. For example, plug-ins required for an Integration Broker configuration can belong to one group, whereas the plug-ins required for a Search Framework configuration can be another group in the same template. This enables you to configure more than one product in a single configuration program run, and you can also control the sequence in which products are configured. For example, you can set Integration Broker to be setup and configured first and the Search Framework second to account for the dependencies the Search Framework has upon Integration Broker. Your configuration templates can be exported from one environment and imported by others so you can reuse templates in different environments by editing the configuration plug-in properties and values as required for an environment. Create, edit, manage, import, and export templates. Software as a service, or ‘SaaS’, is known as a software application delivery model over the Internet—as a service. In this model, a vendor develops a web-based software application, and hosts and operates that application over the Internet for use by its customers. This eliminates the need to buy software licenses or infrastructure for the customer. This model also completely eliminates the installation and maintenance of the software/enterprise application, and the same can be accessed through the Internet. The need and innovation arises to free the customer from complex software and hardware management. Alternatively, SaaS applications can be named as Web-based, on-demand, or hosted software. In any case, SaaS applications run on a SaaS provider’s servers. It’s the vendor/provider province to manage access of the application to the customer, including security, availability, and performance and so on. To the customers, it delivers software functionality without the overhead of operating the application. Adoption of this model came from Business Process Outsourcing (BPO), where the complete business processes of a company can be outsourced and managed by other company(vendor/provider). So the idea arises if the business processes, IT processes can be outsourced, why not the Software applications? And why it can’t be act as an important enterprise strategy, provided the fact that the IT and business process outsourcing industry has grown at a very good rate. Data security and privacy are to be considered as a big risk factors (or were may be), as all type of a company data transportation has to happen in this model. As I said “or were may be”, and as the technology grows, there are best in the industry remote security technologies and data redundancy tools are available too, which makes SaaS model less risky and more successful, and in turn, the SaaS adoption is increasing day by day. Oracle as a market leader, aggressive about its marketing approach, provider of great Enterprise products. Workday, in turns, another great product by Dave Duffield (after PeopleSoft) who gave the enterprises its first HRMS globalized product. While the strategy from making the product and selling it, these two differs a lot, however, the outcome and product delivery is same, based on one model only, SaaS (yes, may be for Oracle, 100% not now, but in future). While going through the product statement for both, points which I gathered are broadly based on finding pros and cons of these products over one another. 4. Users claims it faster and more regular in terms of updates. 1. Keeping its approach same as what Dave had for PeopleSoft, its very much US-Centric. May be same as PeopleSoft, he wants to start from there, rather then taking chances to launch it for global at once. 2. Only focus on HCM as of now. For other solutions, integration with other vendors is required. 3. Major modules like Recruitment are missed out. 4. Don’t give any alternative to cloud. There might be customers who are still not ready for SaaS model. 4. Having an alternative, can be installed and run locally too, not just on cloud. 5. Integrated BI (workday can’t have it, integration has to be done). What survey says about SaaS? — 88% customers will ultimately choose a SaaS-based solution in near future. — One in three companies will ultimately choose a SaaS-based solution in near future. •About half of the responses came from multinational organizations. •Two-thirds of the responses came from organizations with more than 5,000 employees. •The survey responses came from a broad cross section of industries, with the largest number concentrated in the manufacturing sector, followed by financial services, IT and telecom, professional services, and retail. Why is SaaS architecture growing in popularity? May be organizations that choose it, choose for its lower ongoing costs and the peace of mind of always being on the current version of the software without owning it. Even they need not to concern about any platform, server or infrastructure. Thinking platform-less would have been good!!! Coming back to the story, how this cloud and recent technologies can change the technicians? I think we can all agree that the heavily-specialized infrastructure teams of the past—the networking team, the server team, the storage team—are no longer sufficient in the brave new world of converged infrastructure that blends networking, virtualization, and storage all together. I’d agree, in general terms, that IT infrastructure and technical folks need to broaden beyond their core strengths into adjacent technologies in order to remain relevant. And by broadening the scope, it doesn’t mean to leave the things which we are working on. It means to do additions, and not subtractions. It will be helpful to understand what goes into application development and the infrastructure dependencies that are the result of the development choices. Again, that’s awareness, and yes—infrastructure engineers and technical folks need enhanced awareness of adjacent technologies and the relationships with their core technology strengths. Regardless of how many layers of abstraction are inserted into, in its simplest form, is another layer of abstraction—someone still has to manage the things. Customers building their private cloud and having highly virtualized infrastructure, pooled resources, self-service provisioning, someone still has to manage it and the ongoing things. Someone still has to ensure that there is sufficient capacity, and that someone needs to understand the core technologies that make the cloud tick. Especially regarding the infrastructure (because that is where I belong from the core), there are many upcoming opportunities I can see. Even if the virtualization of servers, storage, networks, software will happen and happening, management of this infrastructure is still necessary. People who understand this infrastructure—both virtual and physical—are still necessary. People who know the relationships among the virtualization layers and the various technologies are still necessary. Yes, the infrastructure and technical people will change, grow, and evolve, but it’s an opportunity and not the termination. Oh yes, the age of PeopleSoft. Let’s begin with Oracle, when PeopleSoft came under its umbrella. Oracle acquired PeopleSoft in 2004-2005.At that point of time PeopleSoft had 12,200 customers. Oracle has been continuing to invest in PeopleSoft applications and technology to deliver value to PeopleSoft customers. More than 300 additional features have been added since the PeopleSoft 9.2 release. Today 439 companies out of Fortune 500 use PeopleSoft. Currently PeopleSoft has customers across the globe which is mainly segmented into 5 regions – APAC, Japan, North America, Latin America and EMEA with more than 200,000 users use PeopleSoft and in variety of industries. Having collected all the data above, analytics says its time for PeopleSoft to get completely out of reach. Multi million investments in servers, infrastructures and staffing have already been done to keep the things running. In India itself, there are thousands of mid sizes and big organizations are running on PeopleSoft. So the market analyst says its still time to get over from these investments and apply new one. Eventually a change will come, as everyone has to run with the time and technology, however, the kind of features PeopleTools delivered and still making enhancements to cope up with the change in time and industry trends, PeopleSoft is still in a long run. Till PeopleTools 8.52, application version 9.1, to migrate the configuration data from one PeopleSoft environment to another, there were different custom methods customers had to try, DMS scripts, SQL scripts etc. With the release of PeopleTools 8.53 and application 9.2, Oracle has come up with a new tool and methodology, “Data Migration Workbench”, which will help customers to do this task without applying any of the custom methods. This tool provides a method of migrating configuration data between environments as managed objects, rather than using DMS, SQL scripts. With Data Migration Workbench, one can migrate application configuration data. This tool will copy all/selective data from the source database configuration tables to a flat file base and later the flat File can be loaded to target database and before copying the data to target data base one can compare the data too and then load it. This tool has permission and approval process also in between. Data Migration Workbench facilitates the Configuration Management process using Application Data Sets. The Data Migration Workbench is designed to manage the complexity of migrating configuration data across multiple PeopleSoft systems. The Data Migration Workbench provides the ability for any authorized developer to easily define application data sets and to compare and copy the data similar to the way managed objects have been copied and compared. •Enable developers to use PeopleSoft Pure Internet Architecture (PIA) to define data set definitions as a hierarchy of records with some collective properties. A data set definition defines the shape of data set instances. It consists of a hierarchy of one or more record definitions and some properties. Each child record has all the keys of its parent record and optional additional keys. A data set instance has a single root row defined by the unique keys of the root record. Data set definitions are like record definitions: record definitions define a group of fields that constitute a record; data set definitions define a group of records that constitute a data set. Both record definitions and data set definitions are metadata that define the shape of data. •Enable developers using PIA to insert data sets instances ( data content) into projects to represent a unit of work as a data migration project. Data migration projects are like managed object projects: a collection of data set instances having various data set definitions. •Enable developers using PIA or Change Assistant to copy and compare projects containing data sets. •Integrate with the Enterprise Components Approval Framework to provide administrative control of the project copy from file process. •Provide enhanced security to assure that the data set definitions are suitable for copying data, that the user has access to the PIA data set pages, and that user has the right to copy and compare the data. •Provide an alternative to Data Mover that offers greater visibility and control for managed changes of a customer’s environment. The two main components in data sets are the Data Set Designer used to define the structure of the data set and the Data Migration Workbench, used to define the data migration project content and to orchestrate copy and compare. Data Migration Workbench shows the current status of a project and prevents inconsistent actions. Once you have defined the data migration project, you can copy the data to a file that can later be compared or copied from file on another PeopleSoft database. The Data Migration Workbench uses a Project Repository as a place in the file system where project files can be copied to and from. The Project Repository is defined in the data base as a repository name, an associated file path, and one or more areas (sub folders) that can contain project files. The purpose of Project Repository is to avoid manually copying project files from one system to another by promoting common definition of shared file locations and providing better security for administrative control of the places that project files can be copied to. 1. Create Data Set Definition. 2. Create or select then populate Data Migration Project. 4. Compare Data Migration Project from file. 5. Review compare and validation reports. 6. 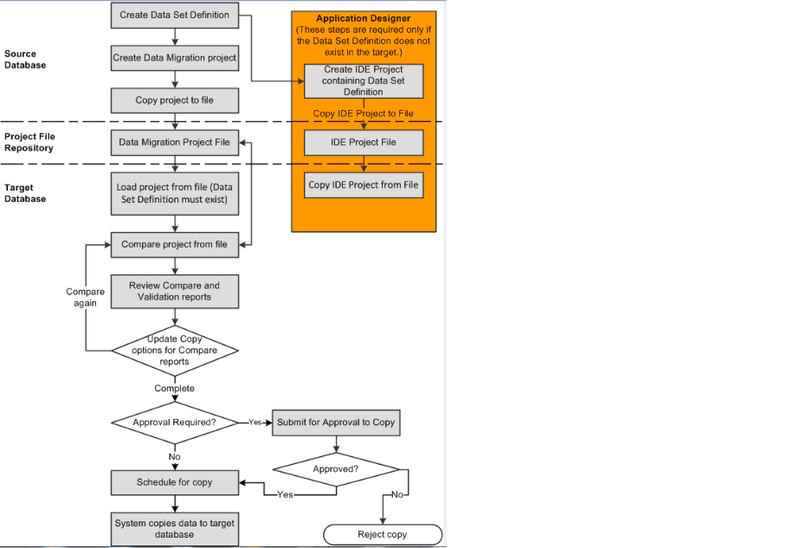 Copy Data Migration Project from file. •The Application Server and Process Scheduler used must both be able to access the project files using the same path. This will require that both are running on Operating Systems that use compatible file access conventions. For example, Microsoft Windows and UNIX-derived operating systems do not have compatible native file access conventions. •The Application Data Set framework is not sufficiently secure in 8.53 to use for sensitive data. •The data set definition must exist on the target database before you load a data set project to the target database. •The data set definition must have the same shape on both the source and target database. Shape is defined by the records and fields included in the data set. Shape equality can usually be achieved most easily by copying a managed object project containing the data set definitions from source to target prior to copying the Data Migration Project. But if the constituent records and fields are different between source and target matching shape may involve executing database CREATE or ALTER steps to attain equivalence. •Application Data Set definitions containing views or derived records are not copy-able or comparable. •In 8.53, the language selections available in Copy from File do not include COMMON, thus COMMON cannot be excluded during copy. For traditional managed objects COMMON can be excluded, making it possible to copy only the language specific data, leaving the language-independent data (COMMON) unchanged if the object exists on the target. •Data set projects are meant for relatively small data sets of static data.and not recommended for large data sets. •Do not change the source Data Migration Project file after the compare been performed. •Setting up the Project Repositories and areas is a one time activity. The directories should first be created by a system administrator with read/write access permissions for the users who will start the application and process schedule servers. In any PeopleSoft application or PeopleTools upgrade process, you will need to perform a fit gap between your current version of PeopleSoft in order to find the differences. This is a daunting task to do when it comes to delivered functionality. For example, many people want to know what are the major differences between my version and the new one. Oracle provides a cumulative feature overview tool for PeopleSoft to start your fit gap analysis.This tool is basically an Excel spreadsheet, that enables you to quickly understand major changes that have occurred across multiple releases for any give product. For example, if you are on PeopleSoft FSCM 9.0 and are looking for the changes that have occurred between 9.0 and 9.1, this new tool allows you to enter your current version and will provide you with a list of these changes for all releases since your version with detailed descriptions. The same is applicable to any source and target PeopleTools release. If you want to download the new tool, you can go to My Oracle Support at the link below and login with your credentials. To solve this issue, I added PS_HOMEjrebin to the app server AddToPATH variable. After setting up the client on the windows machine, sometimes users get the error message while trying to run pscfg.exe, pside.exe or psdmt.exe. In the PeopleTools 8.50 Installation guide, the task titled “Verifying Necessary Files for Installation on Windows” explains that the issue is caused by the C Run Time (CRT) files not getting updated which will cause PeopleTools not to run. PeopleSoft PeopleTools 8.50 is developed using Microsoft Visual C++ 2005. Microsoft, as part of VC++ 2005, changed the way applications use and ship the required C Run Time (CRT) files (these files are installed as shared assemblies). PeopleSoft PeopleTools 8.50 programs require these files to be present or the programs will not run. The installation is completed automatically. Try running any PeopleTools client executable now.